2012 Annual Conference - 30th Anniversary Celebration! Thank you to all those who submitted session proposals. The deadline was August 15, 2011. All registered attendees received an email invitation to join our new online community, enabling you to connect with each other before and during the conference, view attendee profiles and interests, discover which contacts from LinkedIn and Twitter were attending, build a personalized conference schedule, schedule 1:1 meetings with other attendees and join online conversations. Read The Times Higher Education article on leading international peacekeeper Abiodun Williams, who spoke at the 2012 AIEA conference. Institutions of higher education have an important role to play in addressing the global forces that now threaten to destabilize and diminish our communities. Many are actively engaged in programs that further environmental and energy sustainability, broader access to health care and education, resolution of conflicts, pursuit of fundamental human rights, economic development, and greater cross-cultural understanding in the US and around the world. The 2012 AIEA Annual Conference provides a forum to reflect on the relationship between the internationalization of our institutions and institutional responses to these important global challenges. How do our systems, approaches, resources, and collaborative work support the efforts of institutional players to address local and global challenges? How do we promote, support, and sustain the modes of internationalization that address these far-reaching issues while remaining engaged with the cross-cultural development of students and faculty? How can we maintain our efforts to teach about discrete cultures and geographies while also taking up these world-wide issues? How can student internships and service learning contribute to this work (or not), and how do these new modes fit with our traditional approaches to overseas study, faculty exchange, and the research agenda of our institutions? Panels that create a thought-provoking conversation on these topics, particularly when they engage speakers from more than one nation, are especially invited. Administrative and logistical needs of colleges and universities as their international commitments grow: What new approaches to higher education administration are needed to provide appropriate engagement in public health, conflict resolution, human rights, and other issues that often unfold in logistically challenging settings or in settings that pose unusual security and health risks? To what extent are our institutions only rhetorically supportive of international work, and how can we overcome continuing barriers in resources, procedures, and strategic unity? Defining our values in internationalization: What do we mean by global citizenship? Do some of our messages signal that experiences in established institutions located in thriving countries among relatively healthy populations are no longer truly “cross cultural”? Do we assume that students who travel to more challenging sites to engage in “service” are learning more? What are the underpinnings of these assumptions? How do we communicate our values? Recognizing and managing impact: How do an institution’s actions reverberate beyond its own national boundaries? What are the responsibilities of those who oversee international education in shaping and assessing institutional impact on communities in another country? How has the phrase “hands on learning” translated to overseas settings, and what have been the effects (both positive and negative) of such initiatives? Partnerships, consortia and networks: How can partnerships and multi-institutional alliances enable institutions to collectively tackle the challenges of our time and succeed in problem-solving? 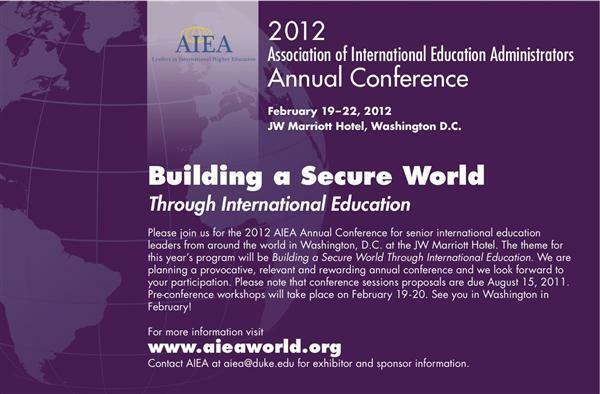 AIEA invites the submission of proposals for its 2012 conference at JW Marriott in Washington DC on Feb 19-22, 2012. Pre-conference workshops will be held February 19-20. The conference will begin in the afternoon of February 20 and end in the afternoon of February 22. Institutions of higher education have an important role to play in addressing the global forces that now threaten to destabilize and diminish our communities. Many are actively engaged in programs that further environmental and energy sustainability, broader access to health care and education, resolution of conflicts, pursuit of fundamental human rights, economic development, and greater cross-cultural understanding in the US and around the world. The 2012 AIEA Annual Conference provides a forum to reflect on the relationship between the internationalization of our institutions and institutional responses to these important global challenges. How do our systems, approaches, resources, and collaborative work support the efforts of institutional players to address local and global challenges? How do we promote, support, and sustain the modes of internationalization that address these far-reaching issues while remaining engaged with the cross-cultural development of students and faculty? How can we maintain our efforts to teach about discrete cultures and geographies while also taking up these world-wide issues? How can student internships and service learning contribute to this work (or not), and how do these new modes fit with our traditional approaches to overseas study, faculty exchange, and the research agenda of our institutions? Panels that create a thought-provoking conversation on these topics, particularly when they engage speakers from more than one nation, are especially invited. Under this general umbrella, the sub-themes below are especially encouraged. How do an institution’s actions reverberate beyond its own national boundaries? What are the responsibilities of those who oversee international education in shaping and assessing institutional impact on communities in another country? How has the phrase “hands on learning” translated to overseas settings, and what have been the effects (both positive and negative) of such initiatives? Professional preparation for addressing issues of global health, economic development, environmental sustainability, conflict resolution, human rights, equity, and others. Sessions will be either 60 or 75 minutes long, including a minimum of fifteen minutes of discussion. Sessions may include a maximum of 3 presenters. Allowance for more than 15 minutes of discussion is encouraged. Other formats: Proposals are also invited for the 2012 AIEA Showcase of Ideas, in which a single institution presents one of its initiatives as a springboard for more general conversation regarding fresh ideas and creative approaches to internationalization issues and practices. Roundtables will be available for conference participants to join the conversation, ask questions, and take handouts back to their home institution.. The Showcase will feature presenters at several roundtables in one large room, with one presenter per table and each with a table top display and handouts at their respective tables. This will be an informal session in which participants can either stay at one table to talk with the presenter there or go to several different tables to discuss informally with the presenter(s) on the specific topic at that particular table. ("Informal" means not structured and more free flowing to maximize the networking that can occur with participants and presenters.) Selection for the Showcase is competitive. Proposals must demonstrate that at least 30 minutes are incorporated for discussion and interaction. Panels should not be “talking heads” but rather allow sufficient time for adequate discussion and exchange between all in attendance. We will give preference to sessions that include multiple institutions and diverse perspectives. Student perspectives are most welcome. Regional diversity, including perspectives from institutions and presenters located outside of the United States, will be favored. The purpose of the conference is to help leaders at institutions (and in the world of international education at large) carry out their responsibilities and develop new ideas. Sponsorship opportunities exist for those with services, programs or products available on the market to assist in this effort, but these services and products are not acceptable topics for sessions. We will not accept proposals that promote a product, program, university, or service. Sessions that focus on one institution will not be accepted. Sessions should focus on lessons learned, challenges and issues encountered and how those were addressed. Sessions should not be a “show and tell” of a university or a program. Presenters are requested to keep details of a specific university to a minimum. Include a content outline describing the major theme(s), challenges, lessons learned, successes and failures, application possibilities for other institutions, etc. that will be addressed in this session. In addition, please include the goals of the session and the methodologies to be used. Remember to include a minimum of 30 minutes for discussion in the panel discussion format session. If there is more than one presenter, explain what each presenter will discuss. Please be as complete as possible and remember that the content needs to have wide applicability, comparative perspectives and an analysis of "lessons learned" useful to higher education leaders. Facilitated Roundtable sessions must describe the topic in detail, the questions posed to participants, and desired outcomes. For the Facilitated Roundtable sessions, explain what each presenter will discuss, how the discussion will be moderated, expected outcomes and how outcomes will be collected and distributed. The session chair will serve as the key contact on the session and is responsible for communicating all session information and details with presenters. Please pay very careful attention to the exact format, language and word limitation required: no more than 75 words for the abstract and for the bio. Biographies may include presenters’ positions and major work accomplishments relevant to the presenter’s session topic. The biography should be written in the third person, and consist of full sentences. Please observe the sample bio format provided in the online submission form. Proposals must be complete at time of submission – it is not sufficient to note “information to be added later.” Incomplete proposals will not be considered in the review process. Proposals submitted without an abstract, full description, or complete bio information on all presenters listed will not be considered. Be sure to save a copy of the proposal before submitting it to AIEA! Online proposal fields must be complete in order to continue with the proposal submission. If you are unable to continue with the submission, it may be that you did not provide the information required. You will know your submission was successful when you receive an electronic acknowledgement. If this acknowledgement is not received, please submit your proposal again. If a hard copy of the proposal is absolutely necessary for completion or if technical difficulties are encountered, please email [email protected] for guidance. Session proposals should NOT be a “show and tell” but rather a focus on challenges, trends, and lessons learned, with ample time for discussion. The Conference Planning Committee will have to choose among many proposals, some of which may be similar, and will seek balance among topics and areas of importance to the membership. Proposals of equal merit cannot in all instances be selected when the result would be an imbalance in the conference’s overall coverage of topics, audiences, and regions. When will I hear about whether my proposal is accepted or not? You will hear by early November, if not sooner, regarding the status of your proposal. How are the proposals reviewed? Members of the conference advisory committee will review proposals. There are at least 3 readers on each proposal. Can I request a specific date or time for my session? No, due to the complexities in conference scheduling, AIEA is unfortunately unable to accommodate specific requests for session scheduling. Sessions will be scheduled between noon on Monday, February 17 and 4 pm on Wednesday, February 19. Please make sure you and your presenters are available during this time frame. If selected, session chairs will be notified of the session date and time in December. Do presenters receive a discount in conference registration fees? No, there is no discount in conference registration fees for presenters. What if one of my presenters is coming only for this session and will not be participating in any other part of the conference? It is possible for a presenter to just come to his/her session and then leave. However, there will be no nametag or conference materials provided and the presenter may not participate in any other part of the conference. If I am using PowerPoint, am I required to bring my own computer? Yes, you will need to provide your own laptop. If I have handouts, am I required to bring copies to the conference? Yes, you should bring at least 50 copies of your handouts to the conference. Handouts are strongly recommended. More questions about this conference? Please view our full 2013 Conference FAQ's section. 2012 AIEA Conference Registration Fee Structure News Flash - Good news! Member fees have not been raised for the 2012 Conference. Full conference registration includes name badge, conference materials, all conference sessions, opening plenary, 2 evening receptions, 1 breakfast, 2 luncheons, admission to the exhibit hall, and coffee breaks. NOTE: Pre-conference workshops are an additional, separate charge from the conference registration fee. Registration fees are refundable, less a $75 processing fee, up until January 13th. No refund will be issued for cancellations starting January 14, 2012. Registrations are transferable until January 13th with a $50 administrative transfer fee. Starting January 14th, transfers will not be accepted. All cancellations must be sent in writing via fax or e-mail to the conference registrar. Please fax or e-mail cancellations, if possible, and expect confirmation within two business days. AIEA is not responsible for problems beyond our control such as weather conditions, campus conditions, travel difficulties, health issues, etc. No refunds will be given in these situations if occurring after Jan 13. Important: It is the policy of the Conference office NOT to supply an invitation letter to unpaid or unregistered participants. Upon payment of registration, the participant may request an invitation letter by emailing [email protected]. The 2012 conference took place February 19-22, 2012 at the JW Marriott Hotel in Washington, DC. One hundred years ago, the great scholar W.E.B. DuBois famously said that the problem of the 20th century would be the problem of the color line. While the challenge of engaging racial and ethnic differences remains with us, the issue of religious conflict dominates our headlines. While we typically see faith presented in the media as a barrier of division or a bomb of destruction, religion has also been a bridge of cooperation. What role can higher education play in positively addressing the challenge of the faith line, and how can international education and partnerships inspire our students to build interfaith bridges? Named by US News & World Report as one of America’s Best Leaders of 2009, Eboo Patel is the Founder and President of Interfaith Youth Core (IFYC), a Chicago-based organization building the global interfaith youth movement. Author of the award-winning book Acts of Faith: The Story of an American Muslim, the Struggle for the Soul of a Generation, Eboo is also a regular contributor to The Washington Post, USA Today and CNN. He served on President Obama’s inaugural Advisory Council of the White House Office of Faith-based and Neighborhood Partnerships and holds a doctorate in the sociology of religion from Oxford University, where he studied on a Rhodes scholarship. 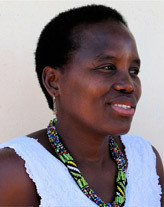 Unity Dow is a lawyer, human rights activist and writer from Botswana who was the ﬁrst female high court judge in Botswana’s history. She is the author of four novels and Saturday is for Funerals, a non-fiction book about the Botswana AIDS crisis co-authored with Harvard researcher Max Essex. As a lawyer, Dow earned acclaim for her stances on women’s human rights and made a name for herself in the landmark Attorney General of Botswana vs. Dow case that effectively overturned a law banning women from passing their nationality over to their children. She worked as a partner in Botswana’s first all-female law firm and was the first woman to serve as a judge on the Botswana High Court. Currently serving her second term as Commissioner of the International Commission of Jurists, she has been appointed the chair of its Executive Committee. She was one of the three international judges on the Kenya Court that oversaw the passage of its constitution. 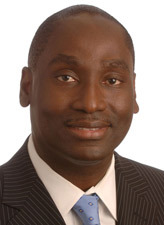 Abiodun Williams is vice president of the Center for Conflict Analysis and Prevention. Previously, he served as associate dean of the Africa Center for Strategic Studies at the National Defense University. From 2001 to 2007, he served as director of strategic planning in the Office of the United Nations Secretary-General. In that capacity, he advised Secretaries-General Kofi Annan and Ban Ki-moon on a full range of strategic issues including U.N. reform, conflict prevention, peacebuilding and international migration. He held political and humanitarian affairs positions in U.N. peacekeeping missions in Bosnia and Herzegovina, Haiti, and Macedonia from 1994 to 2000. Williams began his career as an academic and taught international relations at the Edmund A. Walsh School of Foreign Service, Georgetown University, University of Rochester, and Tufts University. In 1990 he was awarded the Constantine E. Maguire Medal for outstanding service to the School of Foreign Service and its students, and in 1992, he won the School’s teaching award. He was the recipient of a Pew Faculty Fellowship in International Affairs in 1990. Williams has served on the boards of the Academic Council on the U.N. System, the United World Colleges, Lester B. Pearson College of the Pacific, Jesuit International Volunteers, and QSI International School of Skopje. He holds an M.A. (Hons) from Edinburgh University, and M.A.L.D. and Ph.D. degrees from The Fletcher School of Law and Diplomacy, Tufts University. He has published widely on conflict prevention, international peacekeeping and multilateral negotiations. 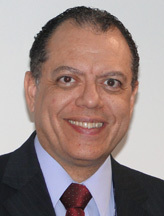 Jorge Almeida Guimarães, President of CAPES, the Brazilian Agency for Support and Evaluation of Graduate Education, holds a Ph.D. from Federal University of São Paulo and a post-doctoral in Biochemistry at the National Institute of Health, USA. He has held teaching and research positions in several Brazilian Universities and has worked as Visiting Research Fellow at Henry Ford Hospital, Cornell University Medical College and at the University of Arizona. 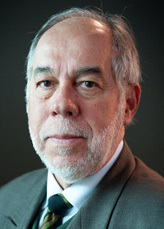 He was CEO of the Science and Technology Government Agencies in Brazil and is the recipient of several awards including the Brazilian National Great Cross of the Order of Scientific Merit. Glaucius Oliva is a professor at the University of São Paulo Institute of Physics of São Carlos, where he also directs the National Institute of Science and Technology of Structural Biotechnology and Medicinal Chemistry in Infectious Diseases. He is President of the Brazilian National Council for Scientific and Technological Development – CNPq. He is a Member of the Brazilian Academy of Sciences and received the Medal of Commander of the National Order of Scientific Merit. ACE-AIEA Internationalization Collaborative registration covers the Saturday, Feb. 18 event only, including continental breakfast and lunch. Attendees must register separately to participate in any AIEA pre-conference workshops or conference events on Sunday, Feb. 19 - Wed., Feb 22. The American Council on Education’s (ACE) Internationalization Collaborative is a network of over 120 institutions which has convened annually for over a decade. This yearly event provides leadership teams of faculty and administrators from across the nation with a forum in which to address pressing themes in the field of international education, share innovative models of campus practice, and network with colleagues. Members of the collaborative recognize that the coordinated efforts of key members of the faculty and administration are essential to the development of fully institutionalized, comprehensive strategies for campus internationalization and global engagement. Through its year-long work with the Blue Ribbon Panel on Global Engagement ACE has sought to examine the international landscape in which higher education operates and develops internationalization strategies. This year’s Internationalization Collaborative meeting will provide participating teams with the opportunity to learn more about the ways in which ACE will continue to support the higher education community through the provision of research, advocacy, leadership development, and practical tools that enhance global engagement. ACE and the Association of International Education Administrators (AIEA) share many common objectives and have begun to explore opportunities to work together through jointly sponsored initiatives. This year’s meeting of the Collaborative will be co-sponsored by both associations and held in conjunction with AIEA’s Annual Conference. Participants are encouraged to attend both meetings and the Collaborative is open to interested participants from among AIEA’s membership. Highlights from the discussion will be captured and used to identify models of promising practice and strategies that can be scaled to a wide array of institutional types, sizes, and governance structures. Overview of ACE’s Blue Ribbon Panel Report on Global Engagement and reflections on panel recommendations. What will these approaches to global engagement mean for your institution and institutional type? For the work of the ACE Internationalization Collaborative? How can ACE use these approaches to continue to best serve the needs of the broader higher education community? What challenges do you face as you seek to engage your institution globally? How might the models discussed be applied at your institution? What other new/innovative/promising models are in place on your campus? How can successful models of good practice be shared more widely with the broader higher education community? This workshop focuses on the leadership of the President and the Senior International Officer to provide vision and strategy for an institution’s internationalization and global engagement. Key leadership elements include developing a productive working relationship, forming the institutional vision and priorities, and planning implementation. Team building and good communication will be a focus of the discussion. Attendees are invited to participate actively by bringing problems, lessons learned, and successful practices from their institutions. Co-sponsored with American Council on Education. Dr. Barbara A. Hill is Senior Associate with the American Council on Education, working with member institutions to help leaders think strategically about internationalization. Hill has been a participant in the Visiting Advisors Program of the Salzburg Seminar, consulting with universities in Russia/Eastern Europe about governance, management, finance, academic structure, and program quality. Hill has held senior administrative positions at several institutions, including provost of Denison University (1986-1990), and president of Sweet Briar College (1990-1996). Dr. Peterson is Presidential Advisor for Global Initiatives at the American Council on Education. Recently she served as senior associate at the Institute for Higher Education Policy. She was executive director of the Council for International Exchange of Scholars and vice president of the Institute of International Education from 1997-2007. She held presidencies at Wells College and St. Lawrence University from 1980-1996. Her board memberships include the Council for International Education Exchange and the National Research University, HSE, Russia. Dr. Leon Richards is Chancellor (CEO) at Kapiolani Community College. For over twenty years, he has driven the development of integrated international education and globalization at Kapiolani and the University of Hawaii system. Kapiolani enrolls 800 international students annually; maintains dozens of institutional partnerships in the Asia-Pacific region; exports the American community college model through leadership in the Community Colleges for International Development; and successfully implements USAID funded development programs in Sri Lanka, Namibia, and Indonesia. Dr. Robert Franco, Professor of Pacific Anthropology, Director of Institutional Effectiveness at Kapi’olani Community College, leads the sustained integration of 3 major innovations: International Learning, Service-Learning, and STEM success for Hawaiians/underrepresented youth. He has provided professional development in 36 states, 3 U.S. territories, and at Kansai University, Japan and the University of Bologna, Italy. He was recently selected one of 20 “Beacons of Vision, Hope, and Action” for the Community College National Center for Community Engagement. Dr. Herman J. Saatkamp, Jr., President of The Richard Stockton College of New Jersey, has overseen significant growth in the College’s assets, endowment, facilities, and collaboration for regional economic growth. Dr. Saatkamp is Professor of Philosophy at Stockton; Senior Fellow, University of Pennsylvania’s Center for Bioethics; and advisor/board member for the Center for Dewey Studies at Fudan University, Shanghai, China. He has established research/exchange programs in twelve countries, and published 48 books and 45 articles. India P. Karavackas was appointed as the Director of the Office of International Services at Richard Stockton in July 2011. Prior to assuming the position, she served as the Director of the Office of Risk Management/EHS. India received her J.D. from Temple University and her Bachelor of Arts in International Studies from Johns Hopkins University. Dr. Linda P. Brady, 10th Chancellor of The University of North Carolina at Greensboro since August 2008, has held leadership and faculty roles at the University of Oregon, Georgia Tech, N.C. State University, the U.S. Military Academy, and Emory University. Dr. Brady is a noted scholar of American foreign policy, international negotiation and arms control. During her tenure at UNCG, internationalization has been incorporated into UNCG’s mission statement and is one of its five strategic areas of focus. Dr. Penelope Pynes, Associate Provost for International Programs, leads the internationalization efforts at the University of North Carolina at Greensboro (UNCG). Since 1995, she has worked to promote student/faculty exchange at UNCG and in the state. Owing to her background in German, she piloted the Baden-Wuerttemberg state-to-state program, which led to the establishment of UNC’s system-wide exchange program housed at UNCG. She holds a Ph.D. in Germanic Linguistics from UNC at Chapel Hill. This seems to describe the international education field fairly accurately these days. While recognition of the importance of international education has never been greater, fundamental shifts in higher education and a lagging economy have combined to challenge us in a variety of ways. As the context around us changes, we, too, need to change and adapt. This workshop builds on past career workshops, but focuses specifically on what we need to do now, in this economy and this setting, to create and maintain an effective professional presence for ourselves, and to continue to lead the international agenda at our institutions. Overcoming delay, frustration and failure. The workshop will run for a full day, and will be highly interactive. Kit Nichols is Vice President of Auerbach Associates, Inc., a Boston-based executive search firm focused exclusively on recruitment for colleges and universities, foundations and scholarly societies, and other related not-for-profit organizations. Kit joined Auerbach Associates after an earlier career in public policy research and consulting. At Auerbach, she leads both academic and administrative searches, with a special focus on the arts and international affairs. Recent searches include the Director and Deputy Director searches at the Yong Siew Toh Conservatory at the National University of Singapore, Vice Provost for International Programs at the University of Virginia, and Vice President for International Affairs at Brown University. She is currently working on the search for the Director of the Asian Civilisations Museum, one of the national museums of Singapore. A graduate of Phillips Academy and Middlebury Colleges, she also holds a master’s degree in international relations from the Fletcher School of Law and Diplomacy at Tufts University. Dr. Riall Nolan is a Professor of Anthropology at Purdue University, and until July of 2009, he was Associate Provost and Dean of International Programs there. Trained as a social anthropologist (PhD, University of Sussex 1975), Dr. Nolan has managed international programs at both the University of Pittsburgh and the University of Cincinnati before joining Purdue in 2003. At Purdue University, his office oversees study abroad, international students and scholars, strategy and policy development for overseas activities, and the development of international linkages. In 2005, Purdue University won NAFSA’s prestigious Simon Award for international education. Nolan is active in both NAFSA and AIEA, and presents frequently on issues of international education practice and strategy. SIO 101 introduces newly appointed or aspiring Senior International Officers (SIOs) to successful leadership and managerial roles in international education administration. Experienced SIOs will lead discussions on comprehensive internationalization – the planning, resources, and political strategies needed for its implementation. In SIO 101, participants coming from the teaching and academic administration ranks, as well as those with experience in study abroad, ESL, or international student/scholar services will find the tools they need to create a new international office or to “recharge” an existing one! As Executive Director of International Programs at Creighton University, Dr. Maria Krane oversees study abroad, linkages, international student/scholar services, and the Intensive English Language Institute. Before becoming an SIO, Krane taught foreign languages and linguistics here and abroad. With graduate degrees in linguistics and educational leadership, she conducted extensive research on the development of an internationalization index and its correlating factors. She recently completed a four-year term on ETS’s TOEFL Board. After joining AIEA in 1992, Krane served the association as Treasurer; CAPS Co-Chair; Ghost Ranch Seminar Co-Facilitator; Executive Committee Member; Chair of the 2003 Conference in Rio; and President (2003-04). Gil Latz, Vice Provost for International Affairs, has been a faculty member at Portland State University for 27 years; he completed his Ph.D. in Geography at The University of Chicago in 1986. His research on comparative regional development policy includes affiliation with Tokyo University (Japan) and University of Florence (Italy). Recent publications include: assessing international learning in the US; educational reform in Vietnam; landscape history in Italy; and controversial issues in Japanese politics and society. Meredith McQuaid is associate vice president and dean of international programs for the University of Minnesota, where she promotes the global dimensions of teaching, research, and engagement across the University system. Prior to her role as dean, McQuaid served as associate dean for international programs in the U of M Law School, where she holds an adjunct faculty position. Before entering academia, she practiced immigration and civil litigation law in Minneapolis. As founding Dean of International Programs of the State University of New York at New Paltz, Bruce Sillner administers study abroad/exchange programs, international student/scholar services, international admissions, the intensive English language program and the Institute for International Business. Sillner co-chairs the SUNY and the World implementation team, is a member of the Gilman International Scholarship Review Panel and was a 2008-10 AIEA Presidential Mentor. He is the 2009 recipient of NAFSA’s Marita Houlihan Award. Increasingly, in mission statements and promotional materials colleges and universities promise that their graduates will thrive in a complex, interdependent, and pluralistic world. However, curricular designs have not always kept pace with such rhetorical commitments. In this workshop, campus leaders from diverse institutions will share key lessons they have learned in their national, international, and local efforts to create curricular pathways by which all students in all programs can achieve essential global learning outcomes. Such designs include both general education and the majors. Workshop participants will define global learning outcomes for their own institutional contexts, begin to map the outcomes onto new and existing curricular terrain, and consider the types of assignments through which students can demonstrate improved global knowledge, intercultural skills, and personal and social responsibility. Workshop participants will also explore successful institutional strategies to help solidify investment in internationalization and global curricular designs. Co-sponsored with American Association of Colleges & Universities. Kevin Hovland is Senior Director of Global Learning and Curricular Change at AAC&U. He is responsible for the curriculum and faculty development initiative, Shared Futures: Global Learning and Social Responsibility. He is also the executive editor of Diversity & Democracy: Civic Learning for Shared Futures, an AAC&U periodical that supports academic leaders and educators as they redesign diversity programs, civic engagement initiatives, and global learning opportunities to better prepare students for principled action in today's complex world. Hilary Kahn is Director for the Center for the Study of Global Change at Indiana University, where she oversees and initiates programs and projects to deepen internationalization. She is also the Director of the Ph.D. Minor in Global Studies and leads the Framing the Global Project (with IU Press) and the Voices and Visions: Islam and Muslims from a Global Perspective Project. Her areas of expertise include international education, global teaching and learning, identity formation, and visual pedagogies. Betty Leask is Associate Professor in Internationalization of the Curriculum at the University of South Australia (UniSA), an Australian National Teaching Fellow, and Visiting Professor at Leeds Metropolitan University in the UK. She has published extensively in the area of internationalization of the curriculum and is frequently invited to present national and international keynotes and run workshops on related topics. The focus of her work is on linking theory and practice in the area of internationalization in higher education. Caryn McTighe Musil is Senior Vice President of the Office of Diversity, Equity, and Global Initiatives at AAC&U. She directs a national initiative, “Core Commitments: Educating Students for Personal and Social Responsibility,” that focuses on engaging students with core questions about their responsibilities as citizens in a diverse democracy. She is a key partner in a Department of Education project called “Civic Learning and Democratic Engagement” and also works with the Council of Europe to further the global aspects of civic engagement. Paul McVeigh is Associate Vice President for Global Studies and Programs at Northern Virginia Community College where he has responsibility for the strategic leadership and operational coordination for all aspects of international programming. He has participated in NAFSA’s Comprehensive Internationalization Task Force and on the Advisory Council for ACE’s Internationalization Collaborative. He has led international initiatives in India, Turkey, Vietnam, Korea, Brazil, and China, has held an NEH fellowship, and has been a Chancellor’s Commonwealth Professor for the Virginia Community College System. What do SIOs need to know about the impact of Bologna on partnerships and other aspects of international education? While Europe is consolidating and enhancing the European Higher Education Area, developed under the Bologna process, it becomes increasingly clear that this process has had and will continue to have considerable effects in other countries as well. The workshop will provide deeper knowledge about the consolidation of European higher education and the challenges ahead. How are the effects on international cooperation and exchange being felt? The impact, for example, of the new mobility benchmark and other political decisions will be discussed. Furthermore, the workshop will discuss the impact of this process now, with particular focus on what institutional leaders in other countries need to know about the impact of Bologna and in working with European institutions. Co-sponsored with the European Association for International Education. Gudrun Paulsdottir is International Strategist at Malardalen University, Sweden. Previously she served as Head of its Admission, Degrees and International Office and Director of Student Affairs. Active in international higher education since 1992, she has been involved in many international development projects and served as an expert for the European Commission on several occasions. Gudrun is currently the President of The European Association for International Education (EAIE). Hans-Georg van Liempd is currently working as Senior Program Manager at Tilburg University. In this position he is responsible for the implementation of the International Campus Strategy of Tilburg University. He previously held the position of Director of the International Office. He combines his work at Tilburg University with his tasks as Vice President of the European Association for International Education. Van Liempd holds an MA in Economics from Tilburg University. As the international presence of US institutions grows, many issues regarding compliance, finance and legal issues, risk management, cash management, tax, HR and other infrastructure and operational support arise. How does the Senior International Officer work with various leaders at the institution, particularly those outside the academic area: general counsel, compliance officers, risk managers, comptrollers, tax and human resource officers? To set an institution on the most successful path as international programs grow, and to get the most out of institutional investment, networking among disparate parts of the university becomes increasingly critical. Learn about resources available for chief business officers (and their staff) in higher education who are motivated to understand international operations and to support them. Learn how institutions have successfully set up networks, specialized functions, or other approaches to ensure sufficient coordination and opportunity to work collaboratively with the provost, researcher or faculty member before one runs into an unexpected problem financially or legally. Sunanda Holmes of Johns Hopkins University, Marta Perez Drake of NACUBO (National Association of College and University Business Officers) and others will lead discussion of successful strategic and organizational approaches to these challenges and will refer to NACUBO's latest web resources that are geared to educate business officers working with the institution's leadership on international efforts. This workshop will focus on a typical US context and is geared to leaders in US institutions, but colleagues from other countries are welcome, should they want to consider adopting similar approaches in their own national context. Co-sponsored with the National Association of College and University Business Officers (NACUBO). Marta Perez Drake is Vice President for Professional Development of the National Association of College and University Business Officers (NACUBO). NACUBO represents chief administrative and financial officers at more than 2,100 colleges and universities across the country. NACUBO's mission is to promote sound management and financial practices at colleges and universities. Before joining NACUBO, Marta worked at Georgetown University, Duke University and three higher education associations. Marta has served on several boards in the higher education, K-12 and non-profit sectors, and holds degrees from Duke University and the University of North Carolina at Chapel Hill. Sunanda K. Holmes is the Global Compliance Officer in the Controller’s Office at Johns Hopkins University. Sunanda has a JD, MBA and an LLM and has more than 20 years of experience as a practicing attorney in the corporate and business law areas as well as working on policy-related issues in international law, education, health care, and governance matters. Her experience includes counseling U.S. businesses on negotiating agreements with foreign partners and preparing legal documents related to international transactions, joint venture agreements, business formation, and agency and distribution arrangements. 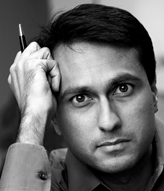 Sunanda was a fellow and an Adjunct Faculty member at Georgetown University Law Center. In 2008-2009, she was a Fulbright Scholar in the West Bank teaching human rights law at the Faculty of Law of Birzeit University and Al Quds University. She is also a member of Maryland and District of Columbia bars. Bob Lammey leads the Higher Education practice at High Street Partners (HSP), a firm which provides international business solutions for universities with programs and activities abroad. He was previously the Director of Global Business Compliance at Harvard University. Bob is a CPA, began his career at Ernst & Young, and has worked abroad in both the UK and the Netherlands. He is also a graduate of the University of Pittsburgh. Note: 2012 Exhibit Spaces Sold Out. See advertising information below. Some sponsorships still available! Thank you for considering the opportunity to exhibit at the 2012 AIEA Conference on Feb. 19-22 in Washington, DC. Several hundred senior-level leaders in international education from across the US and the world will participate in this conference. These leaders and professionals recognize the benefits of networking with organizations in the promotion of international education on their campuses. Exhibitors have the unique opportunity to share information about their organizations with these senior-level leaders and key decision makers. AIEA limits the number of exhibitors in order to maximize exhibitors' time with conference participants. All conference breaks will be held in the exhibit area to ensure quality interaction time. AIEA Exhibitor space is limited and is on a first-come, first-served basis, so be sure to complete the registration form and return it to AIEA along with payment as soon as possible to ensure your space. Please note that exhibitor registration covers one exhibitor and includes a conference registration. Additional exhibitors will need to register separately for the conference. Note: One exhibit table per institution / organization. Exhibitors will be responsible for working directly with the hotel for electricity/wireless or any other a/v needs. Exhibitors will set up on Monday afternoon, Feb 20. Exhibits will be open to attendees from Feb 21 through Feb 22. The Exhibit Opening is Feb 21 in the morning. Take down will start after lunch on Feb 22. Please leave exhibits up through 12 noon on Wednesday Feb 22. Exhibitors will be responsible for working directly with the hotel for the delivery and storage of any exhibit materials. Now accepting exhibitor registrations for 2013 Conference in New Orleans! 2012 prices valid thru March 31, 2012! Write [email protected] and ask for registration form. Exhibitor Fee: Includes exhibit table and 2 chairs, one exhibitor with full conference registration. Note: Additional persons at the booth will need to register separately for the conference. One exhibit table per organization. Full-page ads are also available in the conference program (which will stay online for the next year). Contact [email protected] as soon as possible if interested in placing an ad in the conference program. Conference sponsors have even greater visibility with senior leaders in international education. Higher-level sponsorships include complimentary exhibit space. Contact [email protected] for further details. Become a sponsor at the AIEA Annual Conference and raise your visibility with senior-level leaders in the international education field! This year we will be celebrating our 30th Anniversary - what a great time to get involved! 2011 Sponsors included: ELS Educational Services, Inc. (Platinum), Group of Eight - Australia (Platinum), i-graduate, IDP Education, International Student Protection (ISP), IIE / CIES, Manipal Education, CIEE, World Education Services (WES), Terra Dotta, Dubai International Academic City, Universita Cattolica del Sacro Cuore, Knowledge Exchange Institute (KEI), and UCosmic Consortium. Sponsorships of varying levels are excellent marketing and public relations opportunities for sponsors to promote their organizations to senior level leaders in international education. Sponsors receive high visibility at AIEA conferences, including in the conference program, on the website throughout the year, and during special conference events. Larger commitments also include complimentary conference registrations. Sponsorship opportunities are limited, so act today! Please Note: JW Marriott Hotel rooms are sold out. A discount of five percent (5%) is available to conference participants who travel with American Airlines. To make reservations, call 1-800-433-1790 from anywhere in the US or Canada and refer to your promotion code 3322BC, or go to www.aa.com, choose More Flight Search Options, and insert your promotion code 3322BC in the appropriate box. For a discount on rental cars, call Avis at 1-800-331-1600 and refer to AWD #D256959, or go to www.avis.com. For personal assistance, contact Ray Walker at [email protected] or 1-800-525-7527 ext. 31303.